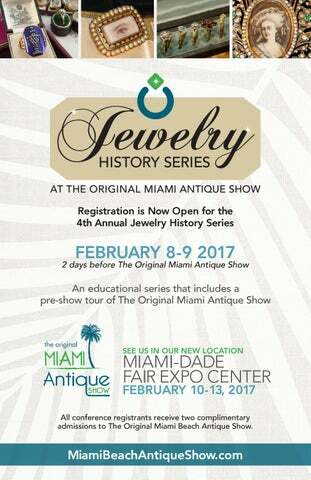 Miami-Dade Fair Expo Center February 10-13, 2017 All conference registrants receive two complimentary admissions to The Original Miami Beach Antique Show. Overview of the Vintage Watch Market - Speaker: Ken Specht Mr. Specht will tell us “what’s hot and what’s not” in the vintage watch world. He will describe how to grade and value a timepiece, how to spot a counterfeit and more. He encourages attendees to bring their watches for evaluation. Carl Fabergé and the Royal Thai Collection - Speaker: Marie Betteley As we most often associate Fabergé with the tsars of Russia and Europe’s kings and queens, little is known about the firm’s illustrious Asian patrons. They included the Sultan of Turkey, Indian maharajahs, the Emir of Bukhara and the Emperors of China and Japan. By far, the most important Asian client was King Rama V of Siam (now Thailand) better known as King Chulalongkorn (1868-1910). Ms. Betteley’s parents went there to catalogue the hidden treasures and she will give a fascinating talk about her parent’s journey of discovery and palace intrigue. The Evolution of Louis Comfort Tiffany’s Art Jewelry - Speaker: Annamarie Sandecki Louis Comfort Tiffany was the son of Tiffany & Co. founder Charles Lewis Tiffany but followed his own path to success, achieving worldwide renown for his luminous designs in stained glass and glass lamps, metalwork and interior design. When he became Tiffany’s first official design director in 1902, he established the Tiffany Artistic Jewelry department in the Fifth Avenue store where his jewelry and precious objects were manufactured. This lecture will give an overview of LCT’s involvement with the creation of jewelry. What’s Hot at Auction - Speaker: Gloria Lieberman What is selling in the marketplace? What has become passé? This lecture has been a popular part of the Jewelry Series and once again Ms. Lieberman will bring us up-to-date. Ancient Engraved Jewels - Speaker: Fred Gray The story of ancient gems encompasses a period of over 500 years. As with the birth of cities we begin with Mesopotamia and their extensive use of seals and amulets. The lecture includes a discussion of gemstones, intaglios, three-dimensional figures and cameos. During the Classical periods of Greece and Rome a more familiar use of gems would appear, only to disappear until the sixteenth century. All of this history will be illustrated by examples from a previously unpublished gem collection. Jewelry Between the Wars - Speaker: Louis Scholz This lecture will take a look at jewelry trends, styles, designs and techniques in jewelry made from the years 1918-1939. 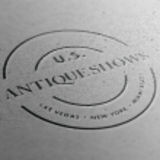 Absolutely Charming: The Charm Bracelet in 20th Century America Speaker: Yvonne Markowitz Charms have always played a part in jewelry history but in the 20th century they became a form of personal biography. This lecture will trace their meaning and popularity throughout the 20th century. Texting from the Past — Love Tokens from the Civil War Era Speaker: Gail Brett Levine Medals and coins are freehand engraved stories that begin with words, images, initials commemorating love, significant dates, weddings, anniversaries, birth, death but most of all family members. A love token was a form of engagement before the white heat of DeBeers marketing made diamond rings important. Young girls coveted and collected love tokens and wore as many as five different bracelets – perhaps that was the start of charm bracelets! Jewelry of the American First Ladies - Speaker: Elyse Zorn Karlin Recent years have witnessed a growing fascination with jewelry in America, accompanied by a desire to know more about how jewelry was worn in the past and how it relates to public figures who wore it. In view of this interest, a lecture on selected American First Ladies’ jewelry provides the opportunity to set these prized possessions within historical context. Special Visit to the Show Floor Lenore Dailey and Louis Scholz booths. Enjoy a preview of antique and period jewelry before the show opens to the public.